Mold is not something that you want to see in any area of your home. It puts ideas in our heads that our home is dirty and contaminated, when in fact, mold has nothing to do with the cleanliness of a home. While black mold is probably the most commonly thought of mold type, there are actually thousands of different mold stains. Black, white, orange, and even green mold are common types that are seen in. Mold produces allergens. It may cause those that are sensitive to respiratory problems to experience allergic reactions, increased asthma attacks, or hay fever. Other symptoms could include nausea, skin rashes, dizziness, headaches, etc… and these effects are just from mold that is considered non-toxic. If “black mold” is found in a home, it can be incredibly dangerous for the family. Often forcing homeowners to move until the the mold problem is solved. At times, this can mean tearing down walls or parts of the housing structure itself to find the cause of the mold. Why is Bathroom Mold so Common? Mold likes damp and dark areas that tend to be on the warm side. Most bathrooms check all of these boxes. Mold will thrive on the walls, ceilings, and even on the tile floor. Black mold is an extreme example of a mold problem. Most bathrooms that you visit probably have traces, or even visible, signs of mold. While not all mold types are toxic, it is important to have them addressed promptly by a professional mold remediation team to keep the problem from spreading. While humidity from hot showers is a common cause of bathroom mold, here are a few other things to watch out for. Leaky faucets. Mold likes water and will follow the leaks! Tubs, sinks, showers… they are all susceptible to mold problems, especially if there is a steady leak. Improper ventilation. Bathrooms need exhaust fans. Without a way to vent out the hot and humid water from our showers and baths, that moisture from the water sits in the air and ends up collecting on the walls, ceiling, and floor. If you do have an exhaust fan and still notice excess water, it’s time to check that your fan is working at the highest level possible. Clogged or slow drains. Remember when we talked about mold heading where the water is? If a drain is slow to empty or is just simply clogged, mold will grow in the pipes. Shower surfaces. Shower liners, shower doors… these are all perfect areas where water gathers on a regular basis. These surfaces naturally become covered in water and soap, combine this with the humidity of the water – and mold has a new home! 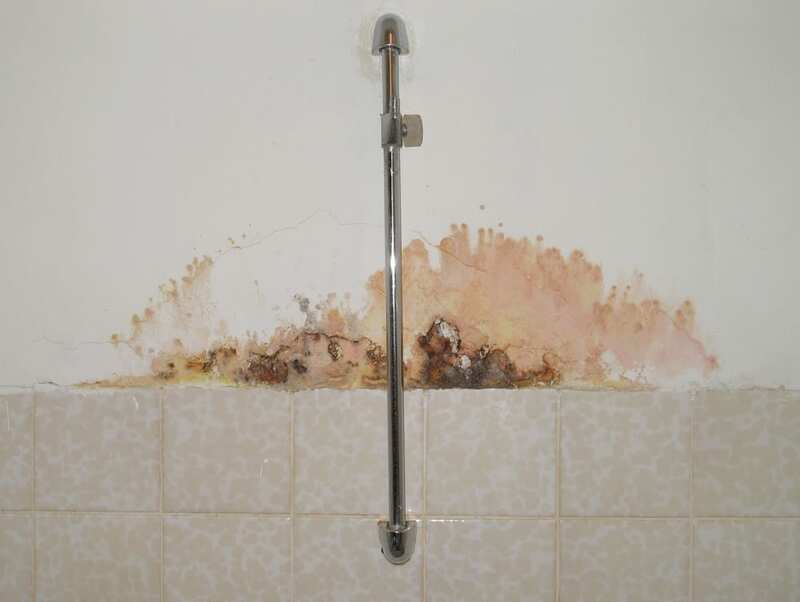 Leaks behind the walls could be another perfect place for mold to take up space. This is a harder problem to spot because the issue is literally between the walls. If there is a crack in the drywall or a leak in a pipe, mold can start to form in the walls themselves. Since you can’t see the mold, it will take different side effects to realize that there is a problem. If you see mold in your bathroom, there isn’t a reason to panic. Using a solution of water and mild detergent is a great do it yourself remedy to begin the process of killing and cleaning the mild. However, to effectively kill the mold spores and ensure they will not return or spread to another area of your home, the experts in mold remediation at A&J Property Restoration DKI are ready to tackle your problem. Call us today to schedule an appointment and consultation!